"These Barnegat tides are the sponges that wipe clean the slate of the beach. Each day a new record is made and each day it is wiped out: records from passing ships, an empty crate, broken spar or useless barrel.... Records, too, of many footprints  the lagging steps of happy lovers, the dimpled feet of joyous children; the tread of tramp, coast-guard or fisherman  all scoured clean when the merciful tide makes ebb." "The Tides of Barnegat is a romance spanning a twenty year period from 1854 until 1874, with a highly melodramatic final chapter involving the newly organized U.S. Lifesaving Service in a tragic ship wreck....This scene of high drama comes as the resolution of a tightly constructed novel by a remarkable man." 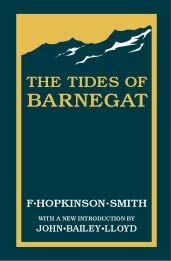 The Tides of Barnegat is a complete reprint, including all 12 original illustrations by George Wright, which appeared in the first edition in 1906. This reprint is published as a softcover and simultaneously as a limited hardcover edition. For the softcover edition, a new painting by Long Beach Island artist Marilyn Ganss, of Harvey Cedars, was commissioned by the publisher. (The original miniature painting will be on view at Jane Law’s Long Beach Island Art Studios and Gallery in Surf City through the fall.). In a Victorian style that captures the gentle ebbing and the fierce moods of the ocean  along with the moods and personalities of the people living along its shores  F. Hopkinson Smith’s novel will be enjoyed as a rich portrait of its time along the coast. The story may surprise modern readers by a period when morality, secrets, and the protection of a good name at almost all costs were held as a duty by some. A new Introduction by New Jersey shore historian John Bailey Lloyd explains some of the peculiarities of the novel, as well as keying the reader in to what is below the surface of all the strident virtue  strength commingled with human weakness. The novel follows two sisters, Jane and Lucy Cobden. Jane, the older by ten years, had vowed alongside her father’s deathbed long before to raise and protect Lucy. When Lucy returns from boarding school in Philadelphia, Jane gives her younger sister all she needs and desires with a caring hand, but does not find in Lucy the same forthright and dutiful character that she possesses. Misled by her love, Jane protects Lucy at the expense of her own life’s happiness and a marriage to a man who loves her. As he approached the old House of Refuge, black in the moonlight and looking twice its size in the stretch of endless beach, he noticed for the hundredth time how like a crouching woman it appeared, with its hipped roof hunched up like a shoulder close propped against the dune and its overhanging eaves but a draped hood shading its thoughtful brow; an illusion which vanished when its square form, with its wide door and long platform pointing to the sea, came into view. Francis Hopkinson Smith was born in Baltimore in 1838 to a distinguished family. He was a great grandson of Francis Hopkinson, poet and signer of the Declaration of Independence for New Jersey. Raised in an artistic and intellectual household, Smith planned to go to college until family financial reverses made this impossible. He worked at a number of jobs eventually becoming an engineer specializing in marine projects. Writing was, in fact, Smith’s third career and one he did not begin until he was over fifty. By then, he was not only a very successful engineer but also an acclaimed and popular artist.... Smith believed that anyone who loved art for its own sake should have another career to provide a living and then in his evenings and on his Sundays...take down his Aladdin’s lamp and give it a rub. His writing career began when he decided to capitalize on his skill as a raconteur and put some of his after dinner stories into print, illustrating them with sketches. When his first novel, Colonel Carter of Cartersville, proved successful, Smith gave up his engineering career and retired to a life of travel, painting and writing in Spain, Italy and Constantinople. He produced a long line of travel books, short story collections and longer works of fiction. He died in New York in 1915.